Vine, or the making of new Vines, sort of went kaput the other day, although I guess the 6-sec videos are still being hosted at the site, and there is something called Vine Camera replacing it. All I know is, the other day I received an email from Vine, warning me that the deadline for using its downloader was upon us. So, I grabbed the ZIP file of all my Vines (videos and image shots, it turns out), and then thought .. now what? I was curious to see the vids all together, and so pulled them into Animoto for this collection. It may only be amusing and entertaining for me, with context. Thanks to Ian for sharing this in his newsletter. The video by Nerdwriter is alarmingly fascinating in closely examining the way Trump uses Twitter (and brings up for me the entirely other important question of what happens when — and I believe it will be “when” not “if” — Trump’s account gets hacked). More analysis is here. And here. This data analysis over use of language, though, is interesting, if one can remove feelings about Trump from the equation. (OK, that’s hard to do.) Parsing through words and tone, and use of devices for writing, make for an interesting way to see how Trump interacts with the world, particularly through the “emotional charged” language (many of his tweets are negative, not surprisingly) and the sharp endings of Tweets and use of exclamation points that are “framing devices” for his rhetorical message. The video notes that we are used to seeing this kind of spontaneous outbursts from our friends and wacky relatives. It’s part of the social networking fabric. Ack. Or, as Trump would end his tweet: Ack! 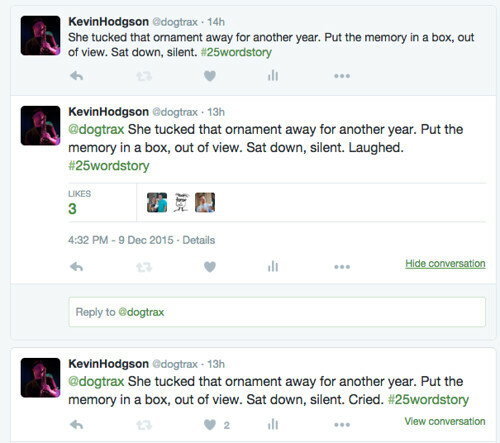 One of the hashtags I keep open in my Tweetdeck is #25wordstory, which was first introduced to me by Brian Fay, and I try to contribute now and then. The small stories, confined by 140 characters, are interesting to write. While some believe the stories have to be 25 words, exact, I am more of the mind that it has to fit inside a tweet. With flash fiction like this, you need to leave gaps for the reader. You can only hint at the larger story. They are interesting to write, and intriguing to read. Writing these very short, short stories reminds me of a presentation I once did for an NCTE Ignite session called Writing, in Short. Sunday morning. 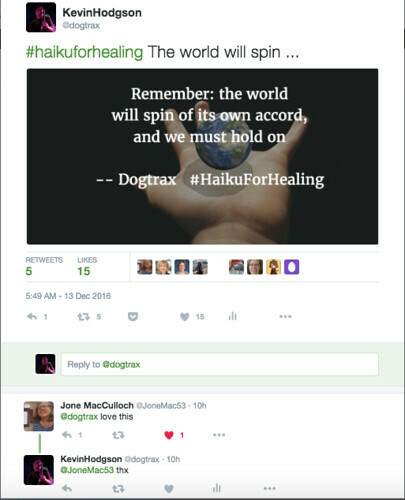 I see my friend Ray is sharing a haiku. It’s about jazz. I can’t resist. I riff off his poem, make my own and send it out. 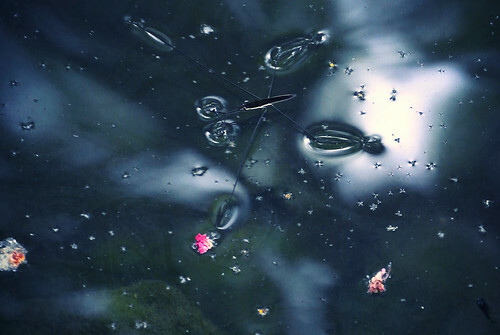 It starts there and then expands into something wonderful: a day of writing and sharing haiku. 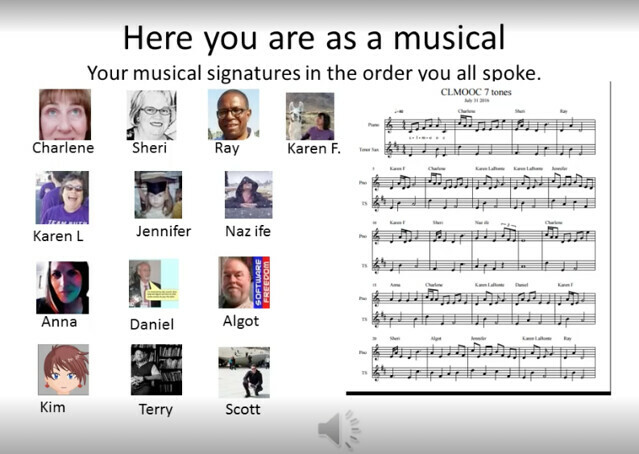 I feel honored to meet so many interested and creative educators in the CLMOOC. Since last week, Karon B. and I have been engaged in an intriguing email conversation that falls under the umbrella of this week’s concept of “Curiosity Conversations” in Make Cycle 3 of CLMOOC. 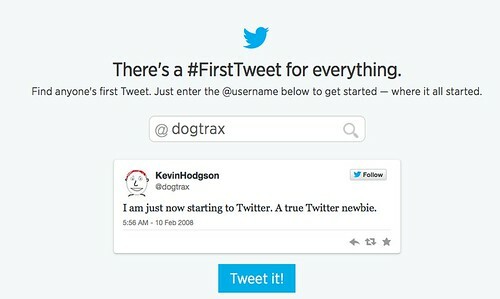 Our interactions began with a Daily Connect, themed on “reaching out” (which she did), and then took a path towards presence in social media spaces (or, rather, non-presence and how that feels), and finally our back/forth reached a point where we worked on a project together that turned tweets into music. Actually, she did all of the compositional work, and I just followed her lead as best as I could. This is what she did, in a nutshell, and where we have sort of ended up. For now. She is still working on other versions. Karon is not on Twitter, for her own valid reasons, but she has followed the weekly Twitter Chats through the curated Storify projects that we put together afterwards. 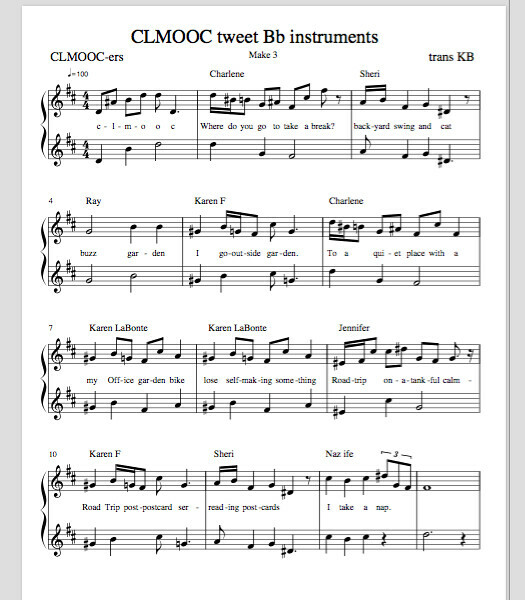 She has also been tinkering with a musical notation program, and so, she wondered if she could take the Twitter feed from the CLMOOC Twitter Chat and code the tweets into musical notation, and then create a “song” of the Chat. I thought that was a pretty cool concept, and she went about it with an intense passion that I admire. I still don’t quite understand her coding system (sorry, Karon! ), even with many intriguing emails back and forth as she worked hard on the project. The five-page music manuscript of the Twitter Chat is so interesting to read through, as themes emerge and counter-melodies of people and ideas. 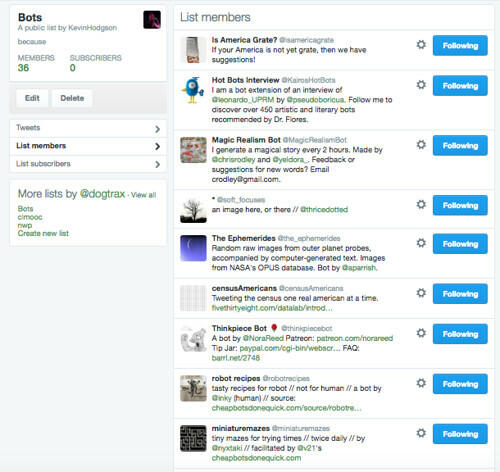 You get a perspective of a Twitter feed that you don’t get in any other way. We’re slanted, on an angle, and see the sharing as music. How friggin’ cool is that, eh? I wanted to do something with Karon’s manuscript. I wanted to find a way to turn her music on the page into music for the ear. So, using Soundtrap recording platform, I tried to record the song with my tenor saxophone, layering the top melody with the bottom harmony parts. I fumbled many times, and still don’t like this rough cut version. But I hope it gives you an idea of how the sharing from Twitter turned into music on the page turned into sounds for the ear. Thank you, Karon, for pushing my thinking about music, social media, and composition over the course of the week, and reminding me of how creative we can be when we think beyond the normal. She saw Twitter as an inaccessible point, and turned it into music. For more on her project, check out the slideshow video she shared in the CLMOOC Google Plus space. She used a midi sound generator to create an audio soundtrack for her presentation, too, so you can “hear” what each person “wrote” in the chat. Nifty. The first CLMOOC Twitter Chat took place last night, but I had a family conflict that kept me away from the computer (not a bad thing). So this morning, I spent time going through the questions and answers from the chat, via the #CLMOOC hashtag, and, more importantly, dove into the conversations during the hour-long discussion on Twitter. 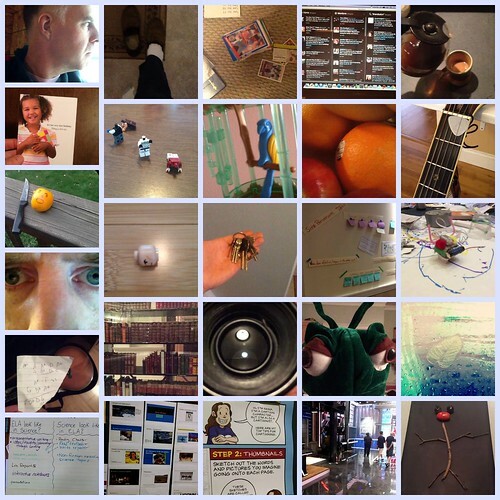 With topics ranging from discoveries to connections to remix, and with important offshoot wonderings about how CLMOOC experiences might impact the world beyond the summer, I felt as if I a water bug traversing along on the expanding notion of ideas and experiences. Being removed from the chat itself gave me a little distance — well, not all that much — and I hope I honored the participants by pulling out what I hope were the most pertinent tweets for this curated archive on Storify. I refrained from adding my own comments here and there in an effort to focus on the conversation as it happened. Yesterday, I wrote this flash fiction story on Twitter with the #25wordstory hashtag. You know … write a story in 25 words (give or take a word here and there, that’s my interpretation). My aim was to infer another story, behind the ornament being put away, and also, to shorten each sentence to make the story more and more compact by the end. And what, I wondered, would happen to that story — still so very short — if I changed that last word to something else. Another emotion. What if I made it “laughed” or “smiled”? Would the whole tenor of the story shift? I think so. I used “laugh.” But now I wonder, after reading it with some distance, if “smile” would not have been better. It’s interesting what you can do in the small confines of a Twitter story. A single word is a powerful anchor of emotion.